Franky is a cyborg who is the shipwright of the Straw Hat Pirates. He first appeared in the Water 7 arc. 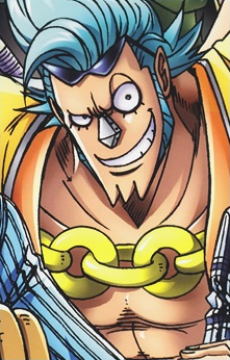 Franky is one of "Tom's Workers", with original name "Cutty Flam". Franky's dream is to build a ship that would travel to the end of the Grand Line. This is the ship that the Straw Hats are currently riding, but his dream is not yet achieved until they make it to the end. Franky usually acts tough and is quickly angered, but he is also very emotional when it comes to sad tales and often bursts into large tears, or on some occasions, plays a song. His most distinguishable personality trait is his flamboyant attitude. He frequently shouts the word 'SUPER' when he's in a positive mood, or adds it into his speech. He also has a signature pose which he uses very often. Franky is quick to defend other people (eg. Franky Family, Nico Robin) and take action if his friends are harmed. He is also quick in making friends, allies, and comrades with even the most unlikely of individuals. Because of this, he is seen as a 'big brother' figure. Monkey D. Luffy bears similar qualities (with the exception of engaging in unnecessary fights) and because of this, despite the disputes the two had in the past, both grew to respect each other during the events of the Enies Lobby Arc.